I cut scrubby trees that were just outside the pasture fence. I toppled the trees over into the pasture. The largest ones were about 5" in diameter. Then I trimmed the poles and tossed the branches back out of the pasture. I dragged the poles over to the garden and left them. I am still trying to find the point where my friend's AR coughs up a hairball. If you recall I had a steel, aftermarket magazine in my friend's rifle and it solidly puked at 20grains of H-4895. I recognized that my data was compromised so I needed to replicate it with the factory supplied magazine. I was sure it was 20.0 grains or more so I loaded up five each of 21.5gr, 21.0gr, 20.5gr and 20.0gr. 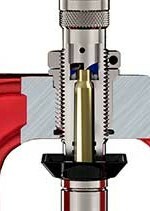 The only failure was that the bolt did not lock when the magazine was empty. "Then I want to speed up the trimming of 223. I saw this Lee trimmer that goes in a die body and uses my drill. I have an RCBS power trimmer but this looks even faster." Well, you know I had to check that out. I find that trimming brass is the most tedious part of reloading. The trimmer loads in a press. I am not sure how the system handles the chips that are generated. Maybe the smart money would be to get a cheap press and mount it horizontally and leave the drill motor running continuously. You gotta love this guy. It looks like he repurposed one of his wife's slippers to be a chute from his prog reloader to his bin of finished goods. Mrs ERJ dragged me to the gym. I am decrepit. I could only do 1/3 the number of push-up I was able to do two years ago. Don't ask about running. I will be a sore puppy tomorrow and Friday. Baby, its cold out there! How much can draft animals pull? Is Amazon-dot-Com really a bank? John, Paul, Ron and Ringo?